Get creative with colour! Learn the secrets of pigments for colouring fibre, create coloured paper and images with pulp. This workshop features a range of different tools to create colourful lines, washes, textures and shapes in handmade paper. – Using squirt bottles and eyedroppers for free hand drawing, students will work with finely beaten fibres to create “pulp paintings”, where the image is an integral part of the paper. – Experienced paper artists will show you how to create unique artwork and decorative paper by cutting stencils, layering shapes and patterns and creating subtle washes of colour. This technique lends itself to loose gestural lines and washes. – We will teach you a variation of Nepalese papermaking using a deckle box (a tall-sided mold) to create little paper paintings. 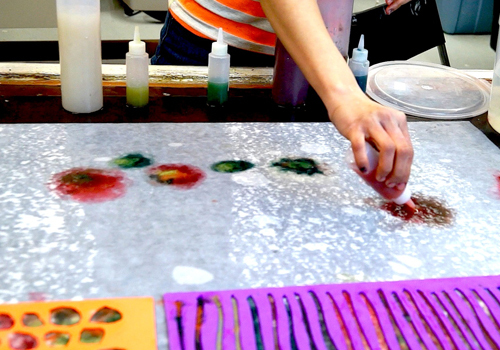 – As a fun wrap up to our course, we will pull out our large vacuum table and allow the group to collaboratively fill huge sheets of papers with whatever kinds of mark making, painting, stenciling and washes of colour they please! This is a four week course running on Thursdays from June 5 – 26.